Beecher Village at Olde Mill Run community is sold out and is not in active development by builder. If you are interested in Beecher Village at Olde Mill Run or similar new home communities, contact us today! Our agents are very familiar with new and newer construction in Chesapeake, and can identify resale opportunities in Beecher Village at Olde Mill Run, as well as builder inventory available in nearby or similar communities in Chesapeake. To view 9 more pictures, interactive maps and the full, detailed description of the Beecher Village at Olde Mill Run community, please Login. New homes in Beecher Village at Olde Mill Run offer location, location, location. The builder must have had active families in mind when these homes for sale were planned and built. 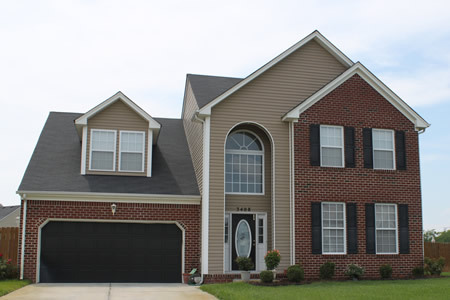 This community is located in convenient Chesapeake, VA, where every place else in Hampton Roads is accessible. Military bases, the Coast Guard Exchange, schools and libraries are all within a short distance to this home base. In addition, this development is close to some of the area’s best natural playgrounds. These detached, single-family homes for sale offer buyers the modern-day conveniences of having new construction but in the area that has a long history. Revolutionary War soldiers walked through the real estate at Beecher Village at Olde Run Mill. Later, this Virginia site was often crossed by those in the underground railroad. History is alive and well in these new homes as they can be the setting for your family’s future. Features include gas fireplace, jetted tub, hardwood foyer flooring, architectural columns and more. Call Chesapeake home and they’ll be plenty to do. Just a bike ride away is a treasure hidden in Hampton Roads - the Great Dismal Swamp National Wildlife Refuge. This serene, natural habitat is home to otters, bats, raccoons, mink, foxes, deer, black bear, bobcat and has sheltered more than 200 types of birds. Activities such as camping, hiking, biking, picnicking and boating allow visitors to enjoy the area and perhaps catch a glimpse of something wild. New homes do have their perks; Beecher Village at Olde Run Mill is also near two parks. The Creekwood South Park and the Deep Creek Lock Park offer nice scenery and a pleasant diversion from everyday life. Golfers need not worry because these new homes are close to two challenging courses. Cahoon Plantation Golf Club and Chesapeake Golf Club offer golfers of various levels the chance to improve their game on green fairways. The builder must have been a golfer too. Biking, hiking, golfing, boating- does it ever end? Well at Beecher Village at Olde Run Mill, it doesn’t have to. Comfort and convenience at an affordable price is what comes with these new homes. These homes for sale in Chesapeake won’t last long as the builder made them irresistible. Send me more information about communities similar to Beecher Village at Olde Mill Run. Our agents gladly offer FREE property tours of Beecher Village at Olde Mill Run, Chesapeake and homebuyer consultations to all serious buyers.